Pipe rammer used to install 60 inch drainage line in cobble and loose sand. In central Minnesota lies a small town known around the world for its pink and white granite. The unique granite found in the Rockville, Minn. area was first discovered in the 1880’s and has since been used for thousands of projects across the country, including the east steps of the U.S. Capitol. It’s estimated that that Rockville sits on a granite outcrop five miles wide and 30 miles deep. Where there’s granite, however, you will also find rocks. That’s evident as you drive into this community of 2,600 residents. Just on the outskirts of town there sit three enormous rock boulders, each one the size of a small house. It gives you some perspective about what you may be getting into as an underground contractor in Rockville. That’s exactly what Jason Clark, owner and president of Iowa Trenchless, headquartered in Panora, Iowa, discovered on his first trip to Rockville. Clark started his company in 2002 after spending a number of years in the business working for other underground contractors. He began working on auger boring projects and has since expanded his business to include micro-tunneling, tunneling, pipe jacking and pipe ramming. He mainly works in the Midwest, but Clark has traveled across the country for various projects. Clark was working on a project near Green Bay, Wis. when he received a call from Douglas-Kerr Underground. Douglas-Kerr was the general contractor for a project along Highway 82 in Stearns County, Minnesota that involved an upgrade to the storm water system. The project called for installing 100 feet of 60-inch and 80 feet of 30-inch storm water lines under a Burlington Northern Railroad track. The only problem? Rocks — and lots of them. Douglas-Kerr called Clark based on his reputation for taking on a challenge and his company’s experience working in difficult ground conditions. As Clark drove into town and saw the size of those rocks he knew this wasn’t going to be an ordinary project. Test holes confirmed the railroad bed and the ground below were mainly cobble and coarse wet sand. Boring or pipe jacking was not an option due to the high risk of a hole opening caving in or collapsing due to the unstable ground conditions. But the resourceful Clark, after some thought and planning, figured he could use a pipe rammer to complete the project with some modifications to the plan. According to Clark, pipe ramming is often the method of choice in cobble or free-flowing soil conditions. The engineers had specified the use of concrete pipe in the original plan. Clark approached the project engineer and proposed using heavy-wall steel casing instead. 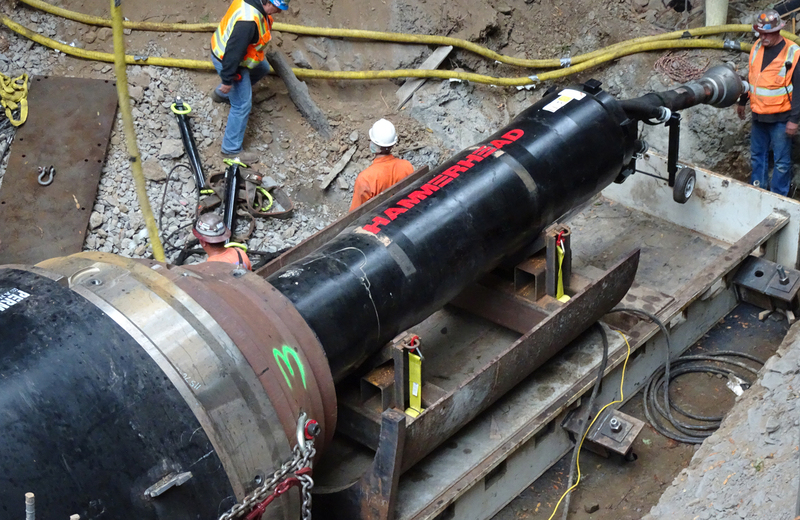 By switching to a heavy- wall steel casing, Iowa Trenchless could use a pneumatic pipe rammer to install the pipe. He contacted Nate Hrabosky with HammerHead in Ocononowoc, Wis. to acquire a 24-inch pneumatic pipe rammer from their rental fleet. Hrabosky also traveled to the site in Rockville and trained the Iowa Trenchless crew on the use of the HammerHead unit. Once the pipe was in place Clark’s crew would use their auger boring machine to clean out the pipe. The engineer approved the new project plan and Clark and his team got to work. The Iowa Trenchless crew began by surveying the site and excavating the working and exit pits. The project required that the pipe be placed more than six feet underground with the two drainage lines installed at a 45 degree angle horizontally under the railroad bed —all while trains continued to pass on the tracks above. Once the pits were completed, Clark and his crew placed the track of their auger boring machine in the working pit. The track was used as a launch platform to guide the 20-foot sections of pipe as they were rammed into place. An over-cut band was placed on the front end of the first pipe section to help reduce friction and a collet was placed on the back side of the pipe to eliminate the need to strap or bind the ramming tool to the pipe. The pipe rammer and first section of pipe were then lowered into the pit and the rammer was connected to a conventional air compressor. The first section of pipe was rammed (similar to driving a stake with a sledge hammer). Once the pipe section was rammed into place, the rammer was reversed out of the collet, the collet removed and a second section of pipe welded securely into place and rammed in. This process continued until the bore was completed. When the full length of pipe was installed, the hammer was removed from the pit and the crew placed an American Augers 60–1200 G2 horizontal auger boring machine onto the auger track for use as the launch platform. The auger boring machine was then used to remove the soil, cobble and sand that accumulated inside the 60-inch and 30-inch pipes. Clark’s crew worked for seven consecutive days to complete the project. He didn’t want to risk taking a day off as this was a low-lying area and any rainfall would have resulted in runoff and drainage to the site. Given the already existing loose ground conditions, this would have complicated the success of the project. Clark went on to say this project was unique due to the rocks and loose ground conditions.